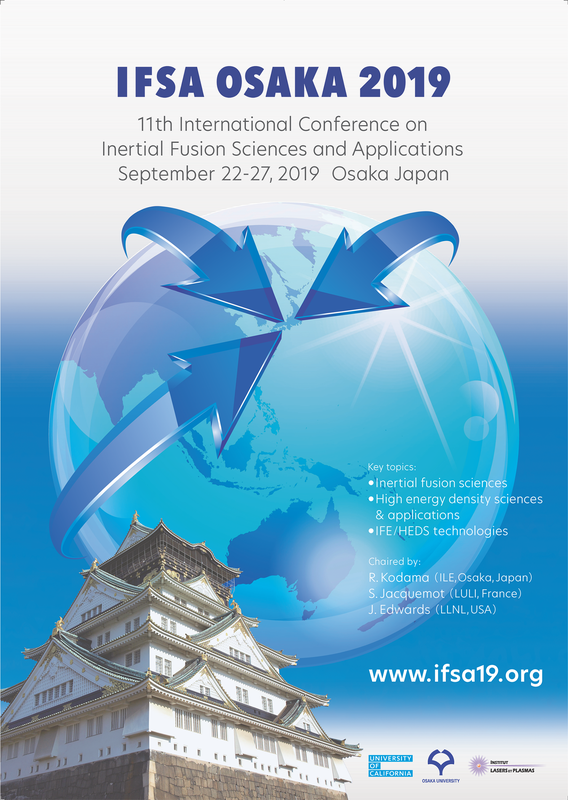 About us: The 11th International Conference on Inertial Fusion Sciences and Applications (IFSA 2019) will be held in Osaka, Japan, on September 22-27, 2019. The goal of IFSA2019 is to bring together scientists and engineers in the fields of inertial fusion sciences and high-energy-density physics, of their applications and of the all the required technologies. IFSA2019 will be co-chaired by Ryosuke Kodama (Japan), John Edwards (USA), and Sylvie Jacquemot (France). The Organizing Chairs are Hiroyuki Shiraga (Japan), Sylvie Jacquemot (France), and Richard Town (USA). The Technical Program Committee will be co-chaired by Shinsuke Fujioka (Japan), Dimitri Batani (France), and Bruce Hammel (USA). The scientific program will be built from invited talks, oral contributions and posters – presenting theoretical, computational and experimental results from facilities worldwide – on any of the topics listed on the webpage Program/Topics. Copyright on Eleventh International Conference of Inertial Fusion Sciences and Applications (IFSA2019) site, you agree not to redistribute IFSA.